Strong performances by Thoroughbred racing’s future stars and a stakes event named in honor of legendary four-time Kentucky Derby-winning trainer D. Wayne Lukas combined with near-perfect weather and a strong schedule of on-track events during Churchill Downs Racetrack’s third September Meet, which completed its 11-day run on Sunday, Sept. 27. Churchill Downs’ daily racing schedule was filled with opportunities to showcase emerging 2-year-old starts that could emerge as contenders next spring for the $2 million Kentucky Derby Presented by Yum! Brands (Grade I) and the $1 million Longines Kentucky Oaks (GI), and its stakes schedule featured performances by horses that were gearing up for competition in the Breeders’ Cup World Championships and other significant events scheduled throughout the autumn racing season. Weather for the meet was close to perfect as the main track was rated “fast” and the Matt Winn Turf Course was “firm” on each of its 11 racing days. The meet’s schedule was trimmed by one day to 11 racing sessions over three weeks to assist Keeneland Race Course with its schedule and preparation for the first visit by the Breeders’ Cup to the Lexington, Ky. track on Oct. 30-31. 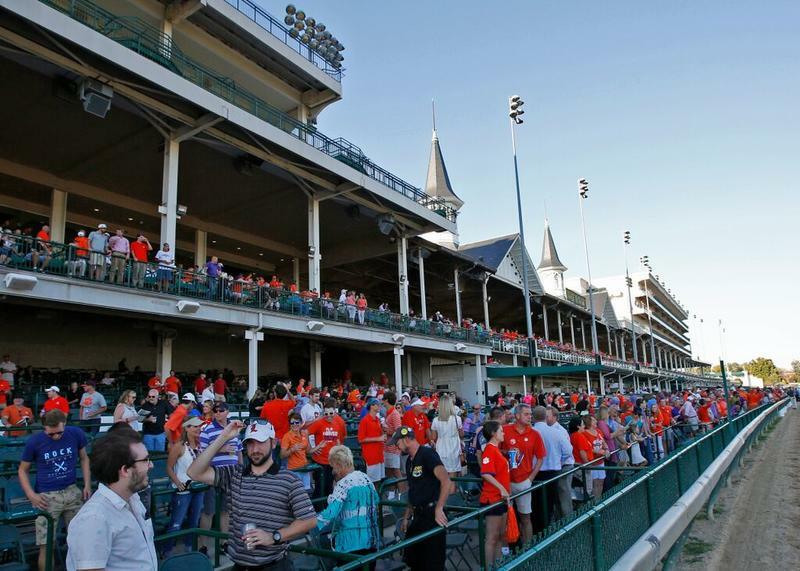 The excellent racing conditions and competitive race fields combined with an attractive schedule of on-track events to create an engaging fan experience beneath the historic Twin Spires. The roster of on-track events during the September Meet was headed by a “Downs After Dark Presented by Stella Artois and Jack Daniel’s” night racing celebration on Saturday, Sept. 19 that attracted 14,786 patrons. Last year’s September session featured a pair of night racing programs. The track’s “Twilight Thursday” racing programs launched during the Spring Meet continued to grow with a pair of opportunities offered during the brief September session. Post time for the Sept. 17 “Twilight Thursday” was moved up to 3:30 p.m. (EDT) to accommodate fans heading to neighboring Papa John’s Cardinal Stadium for the Atlantic Coast Conference football game that evening between the University of Louisville and Clemson. Another strong crowd gathered the following Thursday to enjoy the racing, live music, drink specials and offerings from several local food trucks at the regular “Twilight Thursday” post time of 5 p.m. The races among human competitors during the September session came down to the meet’s final day when Corey Lanerie earning his ninth title as leading rider at a Churchill Downs meet, Steve Asmussen and Dale Romans deadlocked for the honor of September’s leading trainer and Texan Tom Durant collected his first “leading owner” crown with a near-perfect 3-for-4 record with his horses. Average daily purses, purses-per-race and average number of horses-per-race rose during the 11-day meet compared to the results of 2014’s 12-day run. Daily purses averaged $327,817, an increase of 1.8% from 2014’s daily average of $322,041. The average purse paid for the meet’s 109 races was $33,082, a rise of 4.4% from the 2014 average of $31,676 for 122 races offered during 12 racing days. Total purses paid during the 11 days in September 2015 totaled $3,605,992, a decrease of 6.7% from 2014’s 12-day total of $3,864,490. This year’s average September race field featured 7.96 horses, a slight increase from the 2014 average of 7.70 horses. “Our third September Meet at Churchill Downs was solid by any measure and we appreciate the support of racing fans and our horsemen who helped make the meet a success during a time on the calendar that is packed with other attractive events and activities in our community and region,” said Kevin Flanery, president of Churchill Downs Racetrack. “With the return of the Breeders’ Cup Championships to Kentucky just a few weeks away, it’s an exciting time in our industry and we were honored to adjust our racing schedule a bit to accommodate the coming events at Keeneland Race Course. We wish Keeneland, the city of Lexington and the surrounding community the best as racing’s World Championship returns to Kentucky. The racing meet that opened on Friday, Sept. 11 included one fewer racing day than the meets of the previous two years and was conducted for the first time over a three-week period. The earlier September racing schedules in 2013 and 2014 featured four three-day racing weeks, but the 2015 schedule was altered to accommodate the upcoming fall racing session at Keeneland Race Course that will be highlighted by the first visit by Breeders’ Cup Championships to the Lexington track on Oct. 30-31. The early lead on the “Road to the Kentucky Derby” and “Road to the Kentucky Oaks” points systems were on the line Sept. 12 in the $150,000 Iroquois Stakes Presented by U.S. Bank (Grade III) for 2-year-olds and the $200,000 Pocahontas (GII) for 2-year-old fillies. Richard Ravin and Patricia’s Hope LLC’s Cocked and Loaded, trained by Larry Rivelli and ridden by Emmanuel Esquivel, earned a two-length victory in the 1 1/16 mile Iroquois along with 10 “Road to the Kentucky Derby” points. The victory made Cocked and Loaded the early leader in the points system that will determine the members of the maximum field of 20 horses that will compete in the $2 million guaranteed Kentucky Derby Presented by Yum! Brands (GI) on Saturday, May 7, 2016. Magdalena Racing’s unbeaten Dothraki Queen rallied under Lanerie to win the $200,000Pocahontas (GII). The Kenny McPeek-trained daughter of Pure Prize earned 10 points on the “Road to the Kentucky Oaks” system that will determine the maximum field of 14 3-year-old fillies that will compete in the 142nd Longines Kentucky Oaks (GI) on Friday, May 6, 2016. The victories by Dothraki Queen in the Pocahontas and Cocked and Loaded in the Iroquois earned guaranteed spots in the starting gate for those rising stars in the Breeders’ Cup Juvenile Fillies (GI) and Juvenile (GI), respectively, at Keeneland. Both Churchill Downs races were again part of the Breeders’ Cup’s “Win and You’re In Challenge Series” in their respective divisions, and their wins also earned also earned payment of entry and shipping fees for Dothraki Queen and Cocked and Loaded for their journeys to Keeneland to compete in the Breeders’ Cup events. Another September highlight came on the meet’s penultimate day when former claiming horse Geothermal earned the first stakes victory of his career by holding off veteran Departing to win the $175,000 Lukas Classic, a listed race for 3-year-olds and up formerly known as the Homecoming Classic. The race is now named in honor of Thoroughbred Racing Hall of Fame member and four-time Kentucky Derby and Kentucky Oaks-winning trainer D. Wayne Lukas. Owned by A.L. Luedtke, Geothermal is trained by Steve Margolis and was ridden by Robby Albarado. Other September stakes races with possible Breeders’ Cup implications were the $100,000 Dogwood (GIII) won by LNJ Foxwoods’ Super Majesty for Hall of Fame trainer Jerry Hollendorfer and the $100,000 Ack Ack Handicap (GIII) won by Winchell Thoroughbreds LLC’s Tapiture. The victory under jockey Alex Solis by Super Majesty in the seven-furlong Dogwood established her as a contender for the Breeders’ Cup Filly & Mare Sprint or Keeneland’s Raven Run. It was the 3-year-old filly’s third victory in four races and the first stakes triumph. The Asmussen-trained Tapiture earned a second-consecutive bid for the Breeders’ Cup Dirt Mile (GI) when he held off Viva Majorca to take the Ack Ack for his third graded stakes triumph at Churchill Downs. Tapiture was runner-up to eventual Eclipse Award Sprint champion Goldencents in 2014 Dirt Mile at Santa Anita. Other notable stakes performances during the meet included victories by G. Watts Humphrey Jr.’s homebred Frivolous in the $100,000 Locust Grove (Listed), which was the third stakes triumph at Churchill Downs by trainer Victoria Oliver’s mare; a stretch-running victory by Sultan Bin Mishal’s Saham for trainer Brendan Walsh in the Grade III $100,000 Jefferson Cup (GIII) for 3-year-olds on turf; and Sea Jay Racing’s Spelling Again, winner of the $100,000 Open Mind for trainer Brad Cox. The race for leading jockey of the September was wrapped-up early on the meet’s final day by the Louisiana-born Lanerie, who finished with a winning margin of 16-10 over Brian Hernandez Jr. It was Lanerie’s ninth riding crown in the last 10 meets at Churchill Downs, and he’s won the title in each of the track’s three September racing sessions. Jon Court, Julien Leparoux and Marcelino Pedroza Jr. each collected eight victories to finish in a tie for third. Asmussen and Romans, who rank 2-3 behind Hall of Famer and all-time Churchill Downs leader Bill Mott for career training victories at the track, each collected six victories over 11 days to finish in a deadlock for September’s “leading trainer” honors. 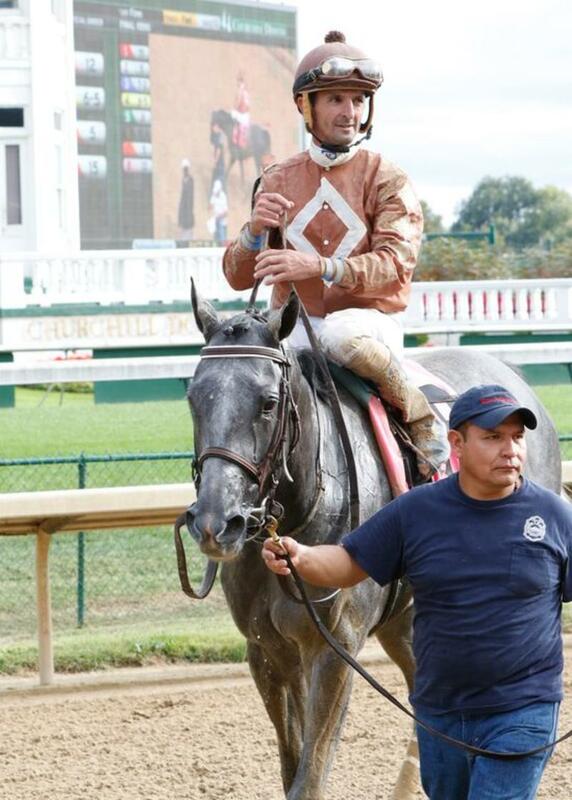 The title was the 16th at Churchill Downs for Asmussen and 13th for Louisville-born Romans. Brad Cox finished just behind the meet’s co-leaders in third with five victories, while Kenny McPeek and Angel Montano Sr. each saddled four winners. Durant, one of the all-time leading owners at Lone Star Park in Texas, started four horses in September at Churchill Downs and ended up with three victories and a runner-up finish. The near-perfect performance by his horses was just enough to hold off career Churchill Downs win-leaders Ken and Sarah Ramsey by a single victory to earn Durant his first “leading owner” title in Louisville. A total of 50 horses were claimed during the September Meet for a total of $798,000. The claims resulted in sales tax revenue of $47,880 for Kentucky’s State Treasury. Racing at Churchill Downs will resume following a brief break with a 21-date Fall Meet scheduled to run from Nov. 1-29. 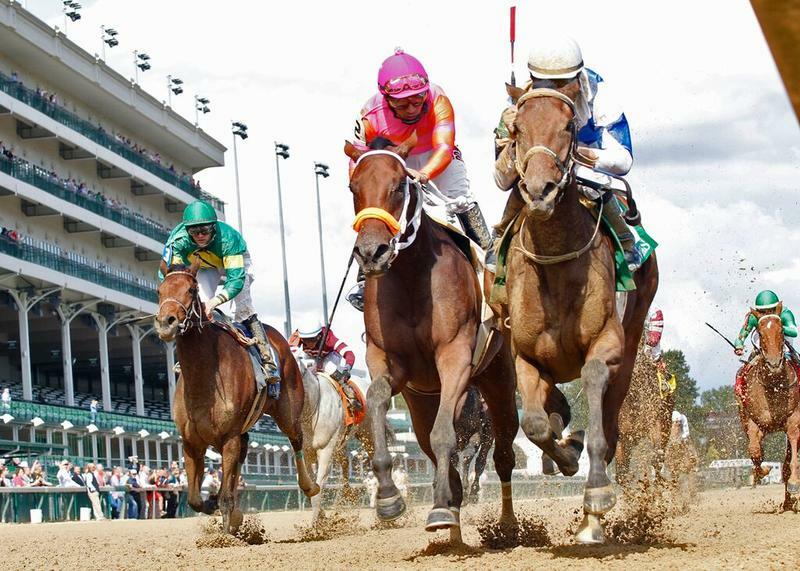 Fall Meet racing will be conducted on a Wednesday-Sunday schedule to conclude a third straight year – the third in the track’s long history – during which the home of the Kentucky Derby has hosted conducted three racing meets during a calendar year.